“High Flight” and John Gillespie Magee, Jr. 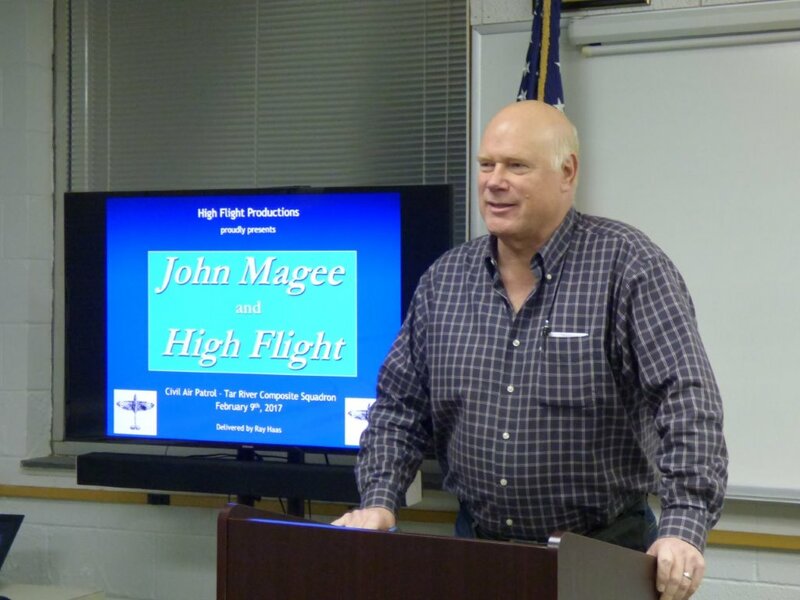 The Tar River Composite Squadron had the honor of hosting a talk by local author Ray Haas about the history of the famous aviation poem “High Flight” and its author, John Gillespie Magee, Jr. on 9 February 2017. Nine senior members, 8 cadets and 5 guests, including 2 from the Johnston County Squadron attended the evening coordinated by Aerospace Education Officer, 2d Lt Nicholas Green. Haas’ inspirational and fascinating delve into the sonnet and the short life of Magee had the avid attention of the entire audience. Haas also shared what had driven him to research Magee and, ultimately, to write his book, "Touching the Face of God." When he began delving into the poem he heard all sorts of stories about Magee – all different – including which nationality he was, etc. Most of all he wanted to know why Magee wrote the poem, because, Haas says “every line of the poem describes exactly how I feel about flying.” And 75 years after it was written, it is still referenced. The poem is required learning at the US Air Force Academy, there are plaques of the poem located at places like EAA headquarters in Oshkosh, at the monument to a Century of Flight north of Kitty Hawk, and astronaut Jim Irwin took a copy of the poem with him to the Moon on Apollo 15. Haas discovered that Magee was born on June 9, 1922 in Shanghai, China, to missionaries. His father was American and his mom was British. Technically Magee was American, because his Dad was American, but he spent less than half his life in China, and spoke Mandarin as fluently as English. Magee left China in 1931 when Japan invaded China, and was sent to boarding school in England. At St Clare’s he started writing poetry and then attended the famous Rugby School, where he developed his poetry further, and won the school’s prestigious poetry prize in 1938. While at Rugby, he also fell in love with Elinor Lyon, the daughter the school principal. Although she is said to not have been in love with him, she remained the inspiration for much of his poetry. In 1939 Magee returned to Pittsburgh to visit his family, but World War II broke out when Nazi Germany invaded Poland, and he was unable to return to school in England, since the U.S. State Department refused to permit him to do so. Magee completed his schooling in Connecticut, but he was determined that his place was in England fighting the evil of Hitler. He told a friend that he wanted to join the Royal Air Force, but his family told him to take admission exams to Yale, which he scored extremely well on – scoring one of the highest ever marks and was accepted to Yale on a full scholarship. The summer of 1940 saw the famous Battle of Britain, meanwhile Magee was in the US, while Britain was fighting for her life. Magee kept on trying to find a way to return to England. Pilots were the critical resource needed by the British after the Battle of Britain. The Royal Air Force was trining pilots in Canada. British Commonwealth members could also learn to fly there, and Americans were gladly taken by this program in Canada. Recruitment began at the Waldorf-Astoria in New York City. Technically it was illegal, but the U.S. State Dept turned a blind eye. Magee found out about this and investigated it, but was told that he needed permission from his parents. Magee’s mother and brothers came from England and his father from China and they tried to talk him out of his plan. At first he agreed, but the more he thought about it, the more he was convinced that he could not go to Yale. He met with the President of Yale to explain why he was not going to attend Yale. Magee gave up a full scholarship to Yale and went to Canada to serve in the war. His first attempt at joining the Royal Canadian Air Force (RCAF) was unsuccessful, as he was found to be underweight by 16lbs – so he got his weight up, and was then able to enlist. With the RCAF training, Magee had gone from residing in an exclusive school to living on the same floor as 1,000 other people. He passed the necessary exams, and started flying at St Catherine’s Flying Club, located about 5 miles from Niagara Falls – he was flying a bi-plane!! Magee turned out to be a natural pilot and soloed first in his class. He underwent further training in Uplands Ontario, at the No 2 Service Flying Training School. Magee was selected to train on single-seat fighters, received his wings shortly after his 19th birthday, on June 22, 1941, and found himself training in Wales. “High Flight” was never written to be published – it appears on the reverse of a letter Magee wrote to his parents from the UK. According to that letter, he started writing it at 30,000 ft, and completed it by the time he landed. No one is really sure why he wrote it – but he clearly loved flying. Tragically, on December 11, 1941, while descending through a break in the clouds in his Spitfire, Magee was killed in a mid-air collision with another aircraft over Lincolnshire. Both pilots died in the accident. He had attained the rank of Pilot Officer. Magee was buried in Scopwick, England and his parents received official notification of his death, after the burial. November 1941 saw the first publication of “High Flight” in the Pittsburgh Times, and ultimately it was published by every paper in the USA. The original poem and letter reside at the Library of Congress. According to Haas, President Reagan used 2 lines of high flight in his speech to the nation after the loss of the Challenger Space Shuttle. Two months later, Reagan invited Canadian Prime Minister Trudeau to dinner, and they spoke about Magee for about 15 minutes. Lines from the poem are inscribed on many gravestones at Arlington National Cemetery. Lines have been recited in many movies. And the poem appears in countless places related to aviation (cadets pointed to a copy that appears in the Tar River Composite Squadron building). Haas is also available for presentations with other squadrons – he is a member of the EAA Speaker’s Bureau – more information can be obtained from http://www.highflightproductions.com- e-mail: ray@highflightproductions.com - the book has been optioned with the intent of making a movie.